I I did a float test with the keel today. 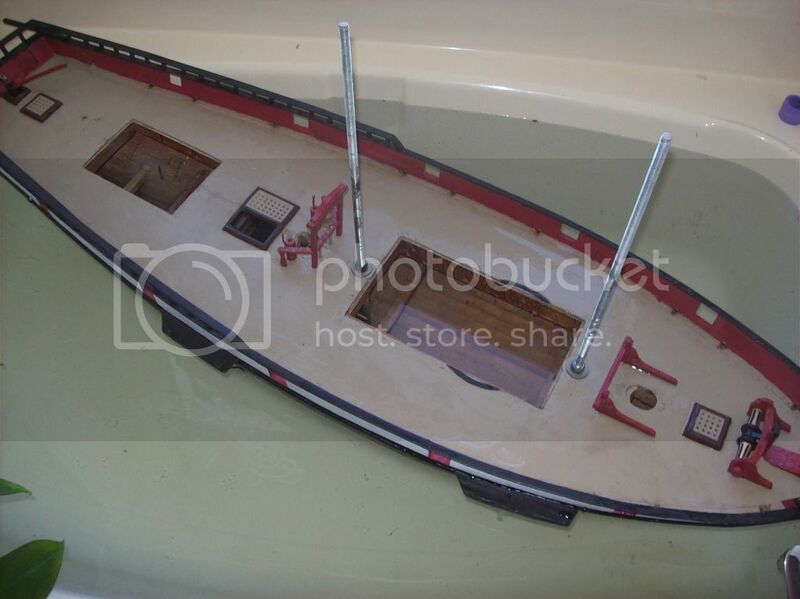 I did notice a few problems when it comes to moving the model as I bumped one of the davits again today, luckily it didn't break but instead came loose from the hull, the channels are fairly fragile and get caught on doorways, the cleats for the gammoning are easy to pop off the gammoning, the figurehead goes exactly where I grab the model in the front to carry it and the weight of the keel amplifies any damage caused by collisions with obstacles wile carrying it. 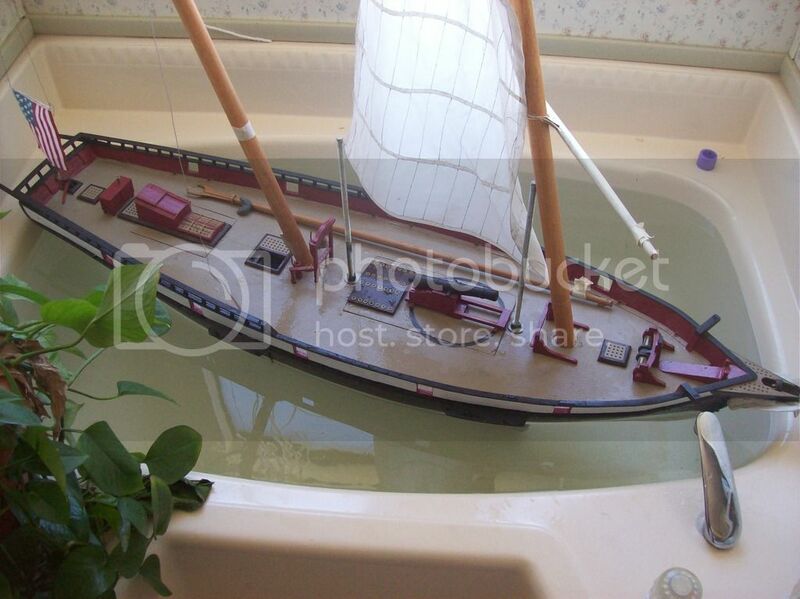 Now to how it held up to the water, I splashed water on the deck and soon noticed the cardboard deck swelling at the hatch corners, the lower portions of the mast had swelled from water that got into the hull and the water inside of the hull would reach the electronics before I would be able to notice her sitting lower in the water. 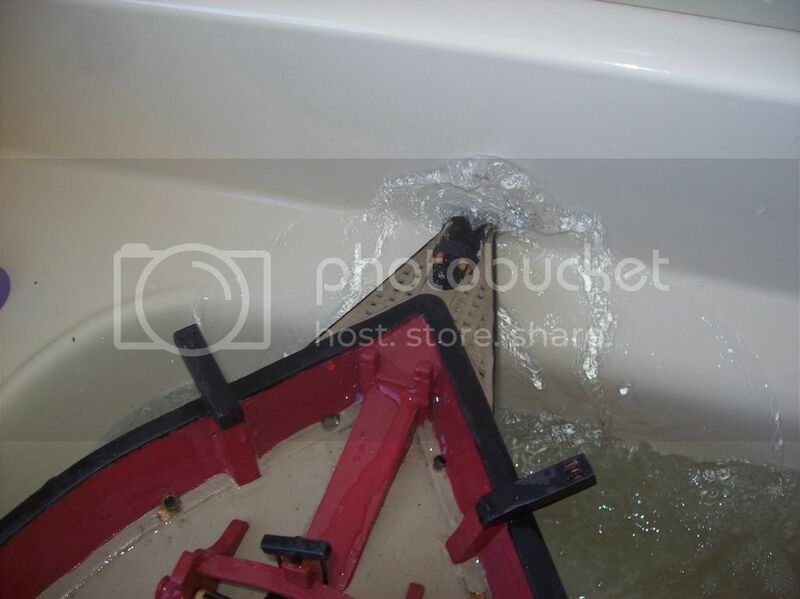 With the 12 pound keel it took six additional pounds plus the battery to get her sitting at her waterline. To test stability I puled on the mast until water started flowing in trough the fairleads this took one pound three ounces force applied to the top of the lower mast to achieve with with the keel about 6 inches (shallow bathtub) below the hull. That is one very large ship! 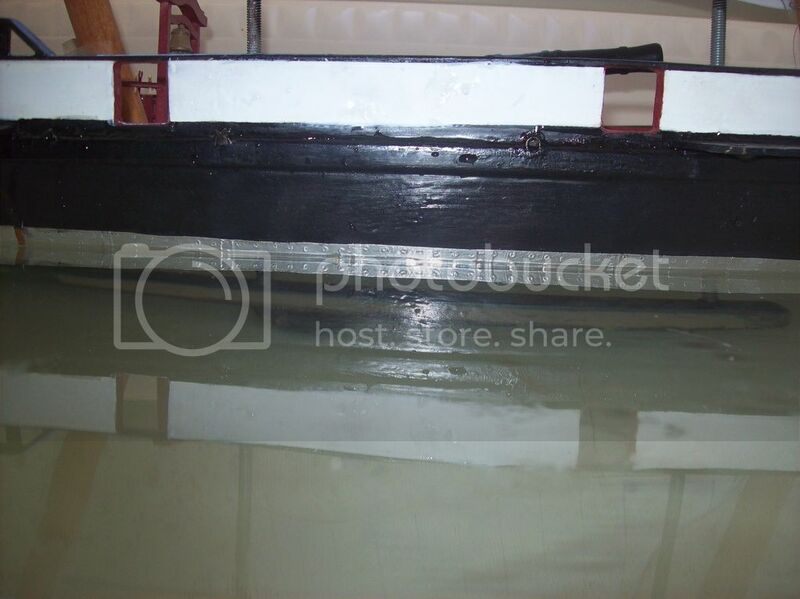 One way I find leaks is by filling the inside of the hull with water to the water line and check exactly where it leaks out when you have the ship out of the water. Now with wood that is not sealed can be damaged by filling the hull with water so you need to know your limits before introducing water to the inside of the hull. On my next model I will make certain changes, the whole upper portion (above the lower wale) of the hull will lift off the lower portion (below the lower wale). The lower hull will have the ballest, rudder control, battery and keel trunk. The mast will be stepped into the deck and all the electronics (not including the battery and rudder servo) will be mounted upside down to the bottom of the deck. If you use brushless motors they can run under water, Pro Boat has waterproof speed controls so the only things at risk are the receiver and battery, unless of course you are sailing in salt water then everything is at risk including the wood hull. By the way I love the looks of your ship fine looking vessel! Thanks bensid54: There are no motors the model is purely sail powered. The servos are waterproof but the rec, batt, etc are not waterproof. I will probably bag the receiver and try to run the wires as high as possible to avoid complications. Sounds like you have all bases covered. I made a new barrel for the pivot gun. This time with a brass tube lining the inside so I could actually fire.